The first place I raced was known as JJ's, in Weymouth MA, probably around 1966. I received a Cox 1/24 Chaparral kit and a Cox controller for Christmas. The track was a home-made 8-lane Masonite with copper tape. Fifteen minutes of track time was 50 cents! Also, Mountain Dew was first available in glass bottles. 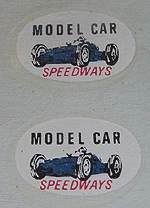 Then I worked at Model Car Speedways in Quincy MA as a rental car repairman. I also painted bodies for the owner. Boy, I wish I had those Lancer bodies now! 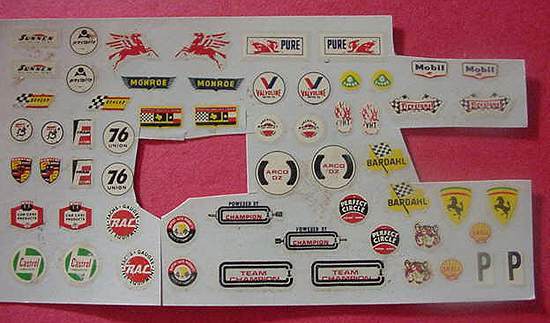 I have a decal from the raceway. I remember there was an American fiberglass track, orange sided, with this high, 90 degree bank, and a car-eating donut. They also had a rental track, more like a oval, and it was always dusty. Then finally, I raced at Modelville Hobbies in Framingham MA on a Blue King! What a track - incredible straight, into a high bank, and then finger, finger, finger, donut, then Nail it down the straight! I can still drive it in my sleep! I won a mini-bike there, racing a endurance slot race. I also got into control line planes there, but Quarter Pounders with cheese from Micky D's was the standard post race menu! My most recent place to race was Too Bad Raceway in Taunton MA. As the name implies, he closed up, just as I was getting back into racing my "vintage stuff." I still have my old wooden slot box, complete with "Parma Tiger" decals all over it, and a Peace sign! from the 70's. 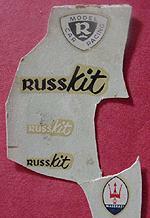 I am also sending some vintage decals. It was fun remembering the models I built and still have a good selection of decals for. Be sure to see John's Vintage Limpach 888, in the Reader's Gallery!